First of I just want to say thank you to Ania Grzesik for inviting us to see The Blue Man Group. Ania was a panelist during our inaugural summer intensive Mentoring Friday’s event. I don’t have any words for this show; I was speechless. I’ve always wanted to see this show. Now that I finally saw it, it was definitely worth it. The thing that stood out most about this show was their use of sound. It felt like having our own jam session. The production used different types of instruments to create their sound. They used different colored paints with their drums — the drums had such a loud bass, I could feel it in my chest! When they used the paint on the drums, the paint bounced back when they played. The paint looked like little tiny colorful spots; it looked like something you would see at a fountain– they were really beautiful. They also used pipes to create sound. They used the pipes to make the sound louder — like when you roll up a piece of paper and speak into it, your voice gets more bass and volume. That’s what it reminded me of and when they connected the pipes; the sound was sooo amazing. I’m telling you it was like their own jam session on that stage, not only did they do sound but they used comedy. That show was HILARIOUS and every skit they did made me laugh. They even brought people from the audience onto the stage! My favorite part of the show was when the Blue Men went all the way to the back of the Astor Place Theatre and grabbed paper rolls and threw them at us to keep it rolling. Plus, their lighting design was amazing; it felt like I was at an underground club. It was the best experience and I recommend people to see the Blue Man Group for themselves. I would definitely see that show again in a heartbeat. It is Friday, October 27th, and I am sitting at my desk poised to write a newsletter in celebration of the Creative Arts Team’s 43rd anniversary on October 31st. My challenge is how to relate, in an e-newsletter, the vibrancy of CAT’s programs and the passion of CAT’s innovative staff, educators, partners, and most of all, the reason we do this work – our amazing participants throughout the city. SCENE: CAT’s office windows at 31st and 6th look out on a beautiful autumn day in Herald Square. While most offices in the city are winding down for the week, the CAT offices are bustling with energy. It is an energizing time at CAT as we now are full swing into the school year. Friday is our liveliest day in the office. It is a planning day for CAT staff and teaching artists who deliver programs in all five boroughs throughout the week. Rehearsals of dramatic scenes and discussions of pedagogical strategies are taking place in corners, by the coffee pot, in offices, training rooms and hallways. I hear – and feel drawn to participate in – impassioned dialogue on strategies for social issue engagement. Along with the serious discussions there is laughter, song and sometimes puppetry. On this particular Friday morning, the Cultural After School Adventure (CASA) team is working on their after-school storytelling programs for middle school students. We are now in our 10th year of delivering CASA programs, funded by NYC Council Members. Next to the CASA office is the Early Learning Program (where the puppets live), the team is working at this moment with colleagues from CUNY’s Office of Research, Evaluation and Program Support (REPS). Together, they are in the third year of evaluating a teacher-mentoring project supported by the New York Community Trust. In the meeting room next to my office, CAT’s Literacy Through Drama (LTD) team is in training for upcoming middle and high school sessions on topics such as gender equity, justice and friendship. Today, they are working on strategies for dual language classrooms. The LTD program, with support from the NYC Dept. of Youth and Community Development (DYCD), uses drama to examine the world and build skills in social and academic literacy. The CAT Youth Theatre team is also in the office using Friday as a training and preparation day. BTW! Save the dates for this year’s Youth Theater performances on February 23-25 and March 2-4, with a special Youth Groups performance on Tuesday, February 27 at 5pm (contact Maureen to reserve group tickets)! The Junior Youth Theatre will share on December 6 at 6pm. There will be an Ensemble improv performance on Saturday, December 9 at 8pm (featuring Youth Theatre Alumni). Now in its 22 year, CAT Youth Theatre helps young people thrive– on stage and in life. 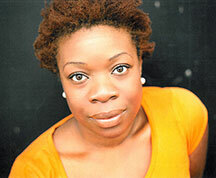 Members create socially relevant, artistically sophisticated original plays. This Friday morning, the College and Adult Program (CAP) team is off-site, leading a “Campus Sexual Assault” symposium at Brooklyn College, organized by the Brooklyn District Attorney’s Office, to address root causes and challenge social norms. 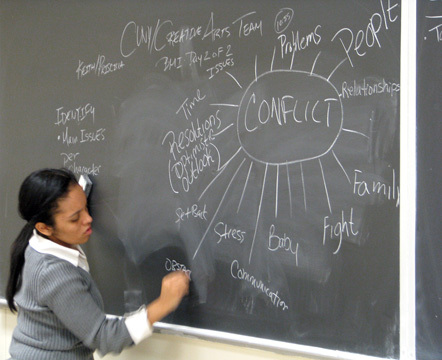 CAP uses interactive drama and skill–building strategies to capture a panoramic view of our society and zoom in on specific issues and behaviors that create challenges in our lives. 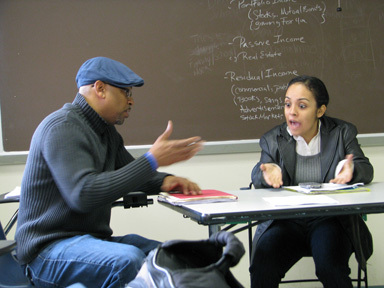 The CAP team works with numerous organizations and initiatives, including (but definitely not limited to): CUNY Black Male Initiative (BMI); the Department of Corrections at Rikers Island; Homes for Homeless (H4H); middle and high schools throughout NYC; and created and runs the Theatre Arts Program (TAP) at CTEA High School in Queens. It is auspiciously dramatic that 43 years ago on Halloween night in 1974, original company members sat around a kitchen table and conceptualized the founding of CAT. Lynda Zimmerman and the founding members envisioned a company dedicated to creating innovative and exciting theatre and education programs that engaged students and the public in learning through drama by addressing timely social and curricular issues. As we gear up for the next 43 years at CAT, we all look forward to seeing you at CAT events, sharing opportunities to participate and updating you on the work ahead. November 3rd is the Early Bird registration Deadline for CAT’s NYC Student Shakespeare Festival (NYCSSF), a program for 2nd-12th grade students that provides a structured process of CTLE-credited teacher training, in-school residencies and a culminating festival at the Lucille Lortel Theatre. NYCSSF is supported in part by DCLA and NYSCA. CAT’s Young Adult Literacy Technical Assistance program (YALTA) is organizing a cross-site trip to the Intrepid Sea, Air & Space Museum for Young Adult Literacy Program (YALP) staff and their students in mid-November. YALTA delivers professional development to YALP, a program of the Mayor’s Center for Economic Opportunity (CEO) and DYCD, for youth, ages 16-24, building skills to enroll in a Test Assessing Secondary Completion (TASC™) Preparation Program and eventually earn their HSE (High School Equivalency). The MA in Applied Theatre Program is conducting a Racial Justice Weekend on Saturday and Sunday, November 4th & 5th, from 10:00am-6:00pm. The Creative Arts Team (CAT) is one of the K-16 Initiatives under the Office of the Senior University Dean for Academic Affairs, at The City University of New York (CUNY). When I was a student, the after-school theater program was a large part of my life. I spent many hours working on plays, musicals, and other showcases as part of my high school’s drama club. My school didn’t offer any in-school theater classes, so any involvement was extracurricular. It wasn’t always easy balancing my schoolwork demands with club responsibilities, but I wouldn’t have had it any other way. The drama club members were “my people,” they liked the offbeat things that I did and we had enormous amounts of fun together. I was a member of the stage crew- building and painting sets, hanging stage lights, setting up speakers and microphones, and moving set pieces during performances. The stage crew became a second family to me, a place where I felt like I could be myself. I was also good friends with many of the performers and musicians in the drama club. We were bonded by similar interests and shared experiences. A large part of who I am as a person comes from my experiences after school in my high school auditorium. The value of my after-school participation is difficult to measure, but easy for me to see. Fast forward 10 years. I now work as a Program Manager at the CUNY Creative Arts Team (CAT), administering our “CASA” (Cultural After School Adventures) programs. Funded by the NY City Council through the Department of Cultural Affairs, CASA brings after-school arts programming to schools across the City. CAT is delivering CASA programs to 22 schools this year. It’s no easy feat working with that many schools in one program, but I find great satisfaction in making this program successful at CAT, especially from my own experiences participating in an after-school theater program. The work we do with our CASA students involves using theater in ways I didn’t even know were possible when I was in drama club. We work with students from 1st through 12th grades, inviting them to learn about theater, about one another, and about themselves. They learn theater games that teach them performance skills while also building a sense of community. They learn about improvisation and storytelling, and they create their own theater with their thoughts and ideas at the center. 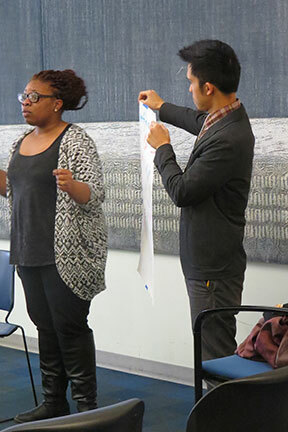 Program Director, Helen White, and Project Manager, Shamilia McBean, train and support the Actor-Teachers as they develop curriculum and work with their students. The young people have opportunities to learn, create, have fun, and express themselves in a program that is free for them and their school. Our CASA program is sometimes the only after-school program a school has, and sometimes we integrate ourselves into a school’s larger after-school structure by working with the school staff. No matter how different the needs of each school may be, we find a way to make amazing theater with their students. I was always drawn to the backstage roles, but I know that if I could have participated in a program like this, I would have been hooked, especially in elementary and middle school. I am motivated daily by my own memories and feelings of belonging as well as hearing from Actor-Teachers and school contacts about how much the students enjoy being a part of the CASA program. It is fulfilling to know that the work I do at CAT helps bring young people together in an after-school theater program, like the one that meant so much to me. We also ask that you keep us in mind for your tax-deductible year-end giving, help keep these amazing memories coming for years to come. Suddenly, and quite by surprise, I was surrounded by a group of girls! I was sitting during an observation of one of our Serious Fun after-school workshops, observing a group of second grade girls put finishing touches on their paper puppets and puppet stage. I must admit I have a love of puppets – all kinds from paper bag puppets, sock puppets to the bigger than life Bread and Puppet Theatre ones. So, I asked the group if they could show me how to make my own puppet! They all rushed over to me with paper, crayons, scissors and glue and helped me make ‘Wendy’ my puppet! The NYC Student Shakespeare Festival is a highlight for me every year. 2015 was our largest Festival yet, with well over 800 students and 30 teachers participating. The mix of public and private schools was profound for the students – with many from our struggling schools showing such pride in performing on the Lortel stage and that they did so well without fancy costumes. A private school 5th grader noticed as well, writing: “I’ve learned that not all schools have as many opportunities as mine has. This showed me to use my opportunities wisely.” Two of the themes that stood out this year were pulled right out of current cultural shifts – two high school groups explored gay marriage and two elementary school classes focused on the Black Lives Matter movement, all through Shakespeare. Amazing. A recent highlight for me was observing my School Violence Prevention team transform their classroom – a huge classroom, with more than 30 kids – while implementing their day 3 session which had been kind of a challenge in many different ways. They were just impeccable. It was wonderful to see the students reaching out, totally and completely engaged in the narrative. It was just great. “The Youth Theatre held its first ever performance in the summer of 1995 at a ragged little black box theater, down along the east side of Washington Square Park. A wildly diverse group of fifty or so city kids, from throughout the five boroughs, came together to create a piece of theater they themselves would devise. Most had little to no experience in acting or performance. Even fewer knew each other beforehand. None would guess the impact those few weeks would have on their lives. I should know – I was one of them, barely sixteen at the time. That was twenty years ago. The importance of what the Youth Theatre does, and what it can mean to a young person, is impossible to overestimate. You come to it at an age where figuring things out can consume your whole being: who you are, who you want to be, where you want to go. You come in on a Tuesday afternoon, and for a few hours you maybe untangle some of that mess, and you work on weaving it into something else. Probably you don’t have much of an idea what it is you’re making. What you do know is you’re making it yourself, with power and ability you maybe didn’t realize you even had, and that counts for more than you can ever know at the time. We wish you a happy and healthy New Year! Marrying content (the subject of inquiry) and form (the artistic discipline) remains a central value in my endeavors as a theatre/film artist, educator, and cultural worker. This value solidified for me as a graduate student in the M.A. in Applied Theatre Program at CUNY SPS, and special credit goes to my applied theatre mentors: Chris Vine and Helen White, who offered a deep and practical study of what marrying form and content may look and feel like in practice. Moreover, as I continue to move forward in my work, I often return to the following quote by theatre scholar Anthony Jackson: “theatre that aims to educate or influence can truly do so only if it values entertainment, the artistry and craftsmanship that are associated with resonant, powerful theatre, and the aesthetic qualities that – by definition – will appeal our senses”. This quote, found in Jackson’s book Theatre, Education and the Making of Meanings Art or Instrument?, reminds me to never lose sight of the theatre form when sharing and implementing the work. It reminds me that the effectiveness of any artistic experience, regardless of the end goal, is directly related to the integrity with which one approaches the artistic form. In other words, it reminds me to wholly embrace the “theatre” aspect of the term theatre-in-education. 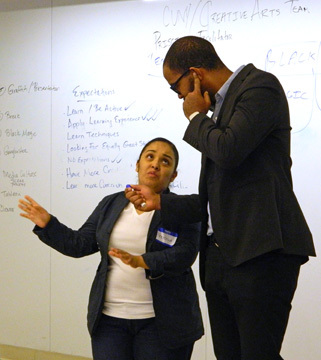 This past March, my co-facilitator Mfoniso Udofia and I had the honor of representing CUNY-CAT at the AATE New York Theatre in Our Schools (TIOS) Conference 2015 hosted by New York University. 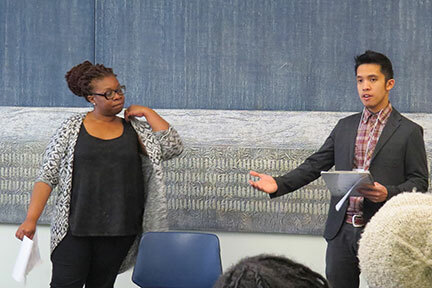 We presented a session outlining the Bronx History through Theatre: Resistance and Renaissance (BHTRR) curriculum which we created under the direction and guidance of CUNY-CAT‘s Artistic & Education Director, Gwendolen Hardwick. I spearheaded the TIOS application a few months prior because I felt immensely proud of the work we did on the BHTRR curriculum; I wanted more people to experience the work. BHTRR continues to be particularly significant for me because it was built on a collective passion to creatively, and theatrically, bring local history and culture into high school classrooms. BHTRR was intended to not only support the learning goals of the 10th grade English classes we serve in the Bronx, but also to integrate content that is more reflective of the culture and history of the students we serve. 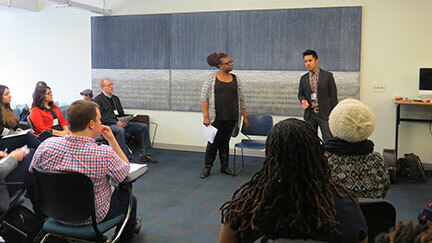 Our session at TIOS, “Cultural Relevance in the Classroom: Integrating Local History (Social Movements and Hip Hop) through Theatre in the Bronx,” offered attendees a practical investigation of key selections of our curriculum. In attendance were students, educators, and others members of the broader theatre-in-education community. Aligned with the concept of marrying form and content, Mfoniso and I facilitated and performed samples of our curriculum, which engaged our attendees in various capacities. We asked our attendees to not only assume the roles of observers and peers, but also, at times, as student participants. We felt it was important for our attendees to have a “lived-through” experience because it would be the most effective method of clearly explaining BHTRR. We closed our session with a short, insightful Q&A with our attendees. An educator from NYU seemed quite appreciative of the commitment that Mfoniso and I brought to the work as both facilitators and as performers. Another attendee, a public school teacher, shared how she was able to identify a good number of learning standards in our work and seemed quite interested in seeing history and theatre used in that fashion. Perhaps even more compelling was something that happened a few weeks later, at the NYC Arts in Education Roundtable’s Face to Face Conference. A graduate student stopped me in the hall, introduced himself and said he’d attended my workshop at the TIOS conference. He said: “thank you for that work. I’ve never really seen anything like that. You all were really performing.” I was very thankful for such positive feedback. Hearing his words reminded me how marrying form and content became, and continues to be, a central value to my practice; his words also reminded of the power of theatre and its ability to leave a mark on the memory of audiences and participants. As I continue to reflect and refine my practice, these reminders help support my view that the aesthetics of theatre is directly related to its effectiveness as a learning tool. I therefore continue to strive to create the kind of theatre experience that doesn’t compromise the aesthetics of the theatre discipline. I strive to make the type of theatre that is wrestled with and crafted, and I strive to do so no matter what circumstances I am working with. Editor’s note: CAT heard from one of the TIOS staffers that Claro & Mfoniso’s session reminded her of how powerful and effective it is to have a team of two teaching artists in the classroom, rather than one, which has been a long-standing CAT practice. Congratulations to the team for making an impact on conference attendees and organizers alike! Yes that’s right. It’s been 10 years. I can’t even believe it. Ten years working at the CUNY/Creative Arts Team. I think six of those years as the Senior Actor-Teacher for the College and Adult Program. Who would have known? I surely didn’t. And not even during my senior year at Hunter College. See what’s funny about my story is that all of the life-changing paths I’ve come across seem to have come up unexpectedly. And then again, I also feel that these paths and turns have been divinely inspired by a much higher power than human circumstances. Theatre was never a field I’d ever imagined myself doing. I was actually going for Pre-Med under the Pre-Professional Programs at Hunter College. But, during my junior year at Hunter, I had to take Intro to Theatre as a pre-requisite. This wasn’t your typical Intro to Theatre class, the Professor for this course was extremely interactive and always encouraged her students to participate by reading out scenes to get a feel for how actors work; to see plays; do improvisational activities, and so on. I remember getting annoyed when she would push us to do activities that required us moving around or working with others. I was a big introvert back then, and still am a bit, in certain moments. I preferred to keep myself behind the scenes. Well, in one of those evening sessions, the professor wanted us to play with Shakespeare. I don’t remember which play we were doing, but I do remember her asking for volunteers, and once again the students were silent, either because they were scared to participate or just didn’t care. Our Professor looked rather sad and I couldn’t bear the awkwardness in the room, so I got up and did the scene with another student. After the mini-performance, I realized how much fun I actually had. And my Professor was so impressed with my work that she suggested I take a Basic Acting class, to which I responded that I was not interested in Acting. My motivational Professor insisted, saying that it would help continue to enhance my presentational skills. I took that Basic Acting class. acting and noticed how my way of thinking and my expressiveness was evolving. Growing up, being in touch with your emotions was not something I learned as a sign of strength; instead, I saw it as weakness. I learned to walk around with a poker face, to hide my thoughts, and keep my guard up, in order to not get hurt. I considered this coping mechanism a sign of power. What I failed to realize was that I was actually getting sick. I was creating an unhealthy form of dealing with my family, personal, and school problems. Since I learned to keep myself guarded, closed, and emotionless, I developed an explosive personality that would burst out at the wrong time, and became voiceless when I needed my voice the most. In the end, I created a wall that seemed impenetrable. As the acting classes progressed, my wall and guard was coming down. I learned the importance of being in touch with your feelings, but also to have control of them and your body. I learned the power of taking effective risks, voicing your concerns, and being vulnerable when needed. I also listened when the theatre Professors at Hunter would tell me that I was a natural—why not pursue Theatre? I wondered if I could take such a leap from Pre-Med to Theatre. What would my grandmother say? How can I justify such a change? And then it hit me: THE ACTING BUG! That’s what I have! And not like the one you think that needs the spotlight all the time. I mean the acting bug that sees how acting—performance, theatre—can be a great tool for healing! It healed me! I’m a walking testimony to it! And so I changed my major to Theatre and Psychology (two fields I love, that happen to go hand in hand). But my journey did not end there; on the contrary, my journey was just beginning. Now that I was studying Theatre, the world began opening doors and networks that helped me exceed in my craft in various ways. And one of those open doors and networks is the CUNY/Creative Arts Team. The first time I heard of CAT was straight from my undergraduate advisor’s mouth. At the time, I was unemployed, doing odd jobs here and there, but I always prayed to God that He could help me find a job that would allow me to grow, be flexible, be surrounded by other talented artists who I could work with and learn from, and help people using theatre. At first I asked my undergraduate advisor if the company did drama therapy, to which she clarified: “no, they are more like an education-based theatre company. They are hiring, I spoke with the Executive Director who is a good friend of mine. I can put the word out for you so they can schedule an interview with you.” I have to confess I was scared. There was a part of me that did not want to call CAT. But I also learned in Theatre the importance of taking risks, of taking advantage of opportunities when you see them, so I called CAT and spoke to Rachel Castillo, who was then the Operations Manager, now the Director of Operations and Administration. We spoke, had an interview a week later—which I remember being very warm and inviting with much laughter. And, to this day, Rachel is that way. Although I did not get hired for an acting role which is what I originally thought (good thing I brought my Acting resume and my Administrative Resume), I was hired as CAT’s new scheduling assistant. A position I envisioned as not only the key to helping me get into one of the programs as an Actor-Teacher, but also taught me valuable lessons and skills in the logistical and operational structures of the CUNY/Creative Arts Team. It may not have been drama therapy, but it is education, and if there is one thing I value greatly it is knowledge and knowing how to use that knowledge to help or guide others in life’s struggles. Yes, these ten years at the CUNY/Creative Arts Team have had their ups and downs, and yet contained great blessings. CAT is my second home, an unexpected home away from my immediate family. It is where I have realized the many potentials God has given me in crafting my career and affecting lives in such an impactful way. It is here where I have devised my motto in life—my purpose while I have breath on this earth—to Create, Inspire, and Motivate people through the power of Theatre! When it comes to theatre, devising new work has always been the thing that has excited me most. Yet past attempts to create plays in professional theatre settings often ended with lackluster results. What was I doing wrong?! It wasn’t until I became a Master’s student in the CUNY/SPS M.A. in Applied Theatre program, that I began to learn how to work from the ideas of participants – using their assets, skills, and interests to make original theatre. And now I feel like the luckiest guy in the world, because I get to do what I love, full-time, with the young people of the CAT Youth Theatre and Junior Youth Theatre. Last fall, Kevin Ray (my collaborator in running the Junior Youth Theatre program) and I decided that we wanted to share some of the work we do with middle-school aged students in a conference setting. Kevin and I had been working together for some time and had been striving to think about how to make theatre activities and devising prompts accessible to this age group. Through our work we had constantly been exploring the question: how can we, as practitioners, support middle school youth in sharing their ideas, navigating group dynamics, and using theatre to say something about the world? We thought that actively examining this question in a room of professionals would generate a rich dialogue in which Kevin and I could share some of our ideas, and hear from others about what approaches they use. Kevin and I designed a workshop during which attendees could wear two hats—one as a participant, engaging in some of the practical exercises that we do with the Junior Youth Theatre; the other as a reflective practitioner, considering how our approach may—or may not—speak to some of the challenges of working with this age group. An emphasis was placed on collectively exploring different ways that facilitators can guide youth through the creative process so that all of us could learn and grow. Our session proposal was accepted by two different conferences. First stop was the 2014 NYC Arts-in-Education Roundtable Face-to-Face Conference held on the beautiful City College campus last April. 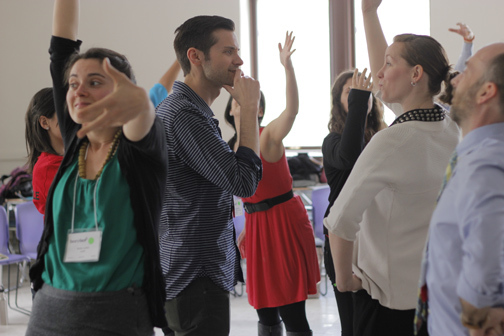 The 32 NYC-based participants in our session jumped into our activities – and had a lot to say about them. One participant expressed how she found the flow of our questioning useful in the way it gradually encouraged youth to think about the world in which we live. There was a general excitement in the room about how we, as educators, can begin to create potential opportunities for youth to delve more deeply into content. Exploring content in a meaningful way with middle-school youth is an area that I continue to circle back to in my practice—how can I really take their ideas seriously and “get underneath” them to begin to understand what they want to say? And once I do—how can this content be developed both intellectually and theatrically? Participants in the Face-to-Face session had a lot to offer on this topic. Several spoke about how we might expand images we had created in our practical session together through different approaches. Others stressed the value of metaphor as a way to get inside issues. One participant described how she uses writing prompts as a way to expand work. 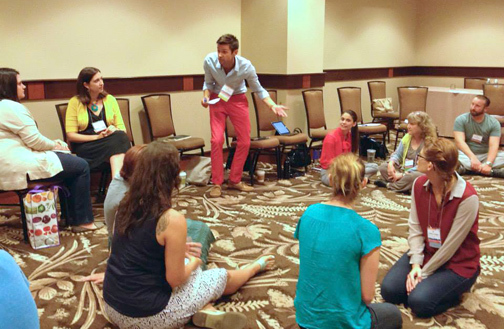 In July, Kevin and I traveled to Denver, Colorado to present at the 2014 American Alliance of Theatre and Education (AATE) Conference, a much larger conference than Face-to-Face, featuring educators, professionals, and practitioners from all across the country. Our session for nearly 30 AATE participants was similar, but further developed using the discoveries made at Face-to-Face – and the post-session conversation was strikingly different. Rather than the sharp focus on developing content that occurred at the previous conference, this discussion moved quickly towards the political implications that may emerge as a result of exploring content. Several participants in the room questioned whether the way we gave youth freedom to address real-world topics could actually create a political divide amongst them. One young woman brought up the issue of gay marriage, and how when her youth brought it up, a huge debate ensued. As a result she averted the issue and made the choice to not pursue it in the rehearsal room. She explained that she couldn’t have angry parents calling and chiding her for teaching “hot topics” to the youth. Her response was not what I had been expecting. My surprise continued when others in the room went on to express similar concerns. One young man offered that he would have opened up such a dialogue with youth, but would only include issues they face in school; another said that youth this age are only expressing what they hear at home from their parents—so we have to be really careful in dealing with what comes up. The young people from the Junior Youth Theatre wanted to make a scene about gay marriage in a recent show. And while nearly all of our youth expressed being pro-gay marriage, when creating the scene they felt it important to include a perspective that wasn’t in favor of the issue. At CAT we encourage youth to explore different perspectives; we aim to create theatre that is not message-driven or preachy, but rather seeks to open up a dialogue about issues and the world we live in. When talking about this at AATE, a participant in the room mentioned how lucky I am to live in NYC where “everyone is so liberal”. The conversation that was taking place continued to catch me off-guard—how could one session yield such different responses? In reflecting upon the session, I realized that while I may be able to lead similar sessions with different groups, what emerges in the room will inevitably be dissimilar. While I went in to the AATE session understanding this in theory, the reality of it emerging in practice reminds me that I always need to be “on my game” and continue to sharpen my listening skills. For not only will there be different responses from various groups, but within these responses there will almost always be difference of opinion. If I had thought more consciously about this in advance of AATE, I could have put my surprise aside, been more present and asked questions to interrogate what the participants were bringing up. I understand it’s not a question of whether anyone is right or wrong when it comes to multiple perspectives. Rather, it’s about how I can facilitate a dialogue between participants where all of them can offer their opinion, listen to others, and think critically. In such a process, all—including myself as a facilitator—have the potential to learn and grow. My experience during the conferences—and my work with the young people of the Junior Youth Theatre, who have radically different opinions—affirms that I can’t make assumptions about how this work will land or what will emerge. I have to be ready for anything. And while this thought can be kind of scary, it’s also what makes this work so exciting to me—that it is living and breathing, and thus always changing.